Grammar Neurotics at Ohio State, Rejoice! Ohio State recently made the switch to Associated Press style. The AP Stylebook is the holy text in journalism school, so anyone coming from a news writing background was surely giddy over this announcement. In writing style, things change. I love how social context makes language malleable and that AP style reflects that. The problem was, buying a new AP Stylebook every year was a serious pain (I finally recycled my 2008 print copy yesterday). 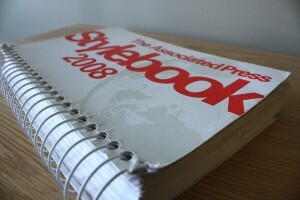 Just look to the stylebook. Breaking editorial stalemates since 1953.